If You Don't Revalue, I'm Gonna Get... Really Angry! HomeBusinessIf You Don’t Revalue, I’m Gonna Get… Really Angry! If You Don’t Revalue, I’m Gonna Get… Really Angry! Well, that was a whole lot of nothing. Bigwigs from the International Monetary Fund met over the weekend in Washington to “tackle global imbalances,” as the BBC put it. Alas, the imbalances broke every tackle and sprinted to the end zone unencumbered. “In my view, it’s too early to make a decision regarding currency exchange rates,” Russian finance minister Alexei Kudrin said last Thursday, telegraphing the outcome. He implied the BRIC countries – Brazil, Russia, India, and China – were united on that score. The likely trend if the status quo remains: Dollar down… gold, precious metals, commodities, energy up! The remaining outlier in this equation: the people’s currency. Geithner called for emerging economies to adopt “a more flexible, market-oriented currency policy.” He didn’t name China, but he didn’t have to. In short, hot money is fleeing low interest rates in the US and Western Europe for China, India, South Korea, etc., where the returns are much higher. The knock-on effect is forcing their currencies up against the dollar and the euro, hurting exports and creating property bubbles. What’s a Dartmouth- and Johns Hopkins-trained banker to do? “In my opinion, the renminbi became undervalued late 2003,” says Pieter Bottelier, writes an adjunct professor of China studies at Johns Hopkins, “when China’s trade surplus – especially its bilateral trade surplus with the United States – began a steep incline. “The initial burst of China’s trade surplus,” Bottelier continues, paraphrasing more or less the hypothesis we put forward in The Demise of the Dollar, “came on the heels of the sharp monetary expansion in the United States… triggered by the switch to budget deficits in the early George W. Bush years. The Greenspan Fed’s interest rate cuts after the NASDAQ collapse and Sept. 11 also played a role. Surprise, surprise. Washington and Beijing are at a stalemate. Meanwhile, the specter of a trade war looms. When the Senate convenes for its lame duck session after the election, it will begin debating a bill that has already passed the frozen stare of Nancy Pelosi in the House: stiffer tariffs on Chinese goods. 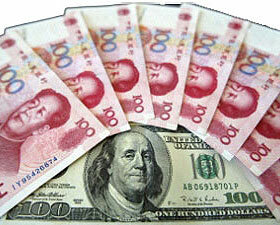 In July of this year (the most recent figures available), Beijing held $846.7 billion worth of Treasury paper. In July 2009, the figure was $939.9 billion. That’s a 10% reduction in China’s Treasury holdings in just 12 months. What is Beijing doing with the proceeds? What it’s been doing all along…acquiring real wealth in the form of energy, raw materials and precious metals. Just yesterday, the state-owned Chinese energy company Cnooc agreed to buy a one-third stake in a Texas shale gas project from Chesapeake Energy for $1.1 billion. Cnooc will put up another $1.1 billion to finance the drilling costs. “Unconventional” oil and gas were the one remaining energy sector the Chinese had yet to pursue seriously. No more. On Oct. 1, another state-owned energy firm, Sinopec, spent $7.1 billion for a 40% stake in the Brazilian unit of the Spanish oil company Repsol. The Chinese are getting a foothold in the offshore Brazil story Byron King’s been writing, excitedly, about. On the commodities front, China’s corn crop is looking good this year – but not so good as to avoid a second straight year of net imports. Don’t expect this trend to reverse: The US Grains Council, back from its annual visit to China, forecasts that China will quintuple its corn imports over the next five years. As of 2003, Beijing kept 600 tons of gold in reserve. In April 2009, Beijing announced it had built that reserve to 1,054 tons – a 76% increase. And there’s no reason to believe that buying has stopped. China is one of the reasons gold is holding strong above $1,300…why corn prices hit a two-year high today…and why oil is steady above $80, despite lower demand in the West. We don’t expect this trend to let up.